Spoiler ratings: Which teams could derail true playoff contenders? College football’s new postseason format has made it possible for teams to bounce back from a single loss and remain part of the playoff picture. But there’s still plenty at stake in every game. Just ask Auburn what a home clash with Texas A&M meant for its chances. Or ask Ole Miss about its showdown with Arkansas. Both the Tigers and Rebels are out of playoff contention, their dreams crushed by teams that were previously eliminated from the championship race. Now, the more devious fun begins. Heading into rivalry week, Ole Miss, Auburn and many other programs have the chance to squash their opponents’ playoff aspirations. Seven Power Five conference teams still have one loss or fewer. Over the next two weeks they will vie to finish in the selection committee’s top four. Let’s look at the possible spoilers and rate, on a scale of one to five, which teams are the most likely to knock their opponents out of the playoff mix. Georgia still needs Missouri to lose to Arkansas on Friday to even have a shot at reaching the SEC Championship Game. However, coach Mark Richt’s team would pose a huge test for either Alabama or Mississippi State if it got there. Freshman tailback Nick Chubb has proven to be a satisfactory replacement for the injured Todd Gurley, and both potential SEC West representatives can be vulnerable to power-running attacks. The key would be if Georgia’s defense, which ranks 18th nationally in yards per play allowed (4.74), can contain offenses led by Blake Sims or Dak Prescott. Keep in mind, coordinator Jeremy Pruitt’s unit held Auburn to fewer than 300 yards for the first time with Gus Malzahn as head coach. This is the Big Ten title matchup most people want to see. It pits Badgers star Melvin Gordon against Ohio State's J.T. Barrett. The Buckeyes are susceptible to the run, allowing 4.1 yards per carry, so the nation’s leading rusher would likely be able to build on his success. However, Wisconsin quarterback Joel Stave doesn’t pose much of a threat, so Ohio State could stack the box. Iowa quarterback Jake Rudock picked apart the Badgers secondary for 311 yards on Saturday, so this potential matchup could turn into a shootout. This game could send Baylor into the playoff. But the Wildcats are the toughest opponent Baylor will have faced since rallying to beat TCU 61-58 on Oct. 11. The Horned Frogs hung 41 points on Kansas State, but the Wildcats are capable of stopping Baylor. Coach Bill Snyder’s crew held Auburn to 20 points on Sept. 18 and allows an average 5.1 yards per play. The Bears don’t have a strong track record against quarterbacks who limit mistakes. Jake Waters could shine. Mississippi State needs Alabama to lose to Auburn to win the SEC West, so the Egg Bowl could be its last chance to impress the committee. The Crimson Tide beat the Bulldogs 25-20 on Nov. 15 by forcing Prescott into red-zone mistakes. Ole Miss has the stout defense to do the same. However, the Rebels would need to avoid the drive-killing blunders that doomed them in a 30-0 loss to Arkansas. Oregon beat UCLA handily on Oct. 11 -- the final was 42-30, but only after the Bruins scored three times in the fourth quarter with the outcome already decided -- so why should a neutral-site rematch be any great risk? Well, because in the past three weeks UCLA has finally looked like the contender it was expected to be in the preseason. 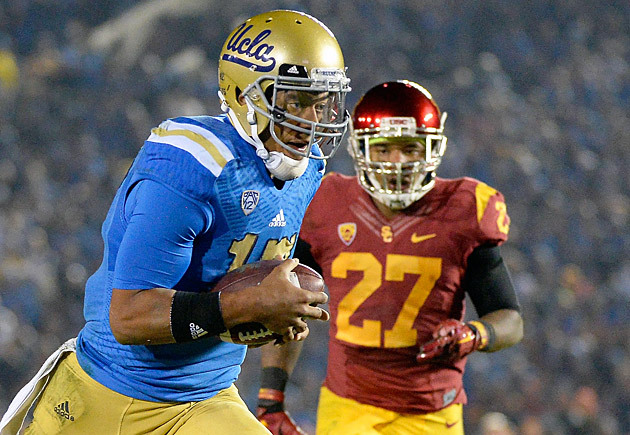 Brett Hundley picked apart USC en route to UCLA’s fifth straight win, and the Bruins defense has appeared markedly improved. UCLA looks like a very different squad than the one that hosted Oregon in October. We all remember how last year’s edition of this rivalry played out. Alabama is in control of its postseason destiny once again, and Tigers fans would love nothing more than to crush the Crimson Tide’s dreams. Nick Saban’s teams have struggled against Malzahn-coached offenses, losing last fall and during Malzahn’s stint as offensive coordinator in 2010. Saban’s defenses don’t always handle up-tempo spread attacks well, reinforced by their issues with Texas A&M in ’12 and ’13. If UCLA loses to Stanford and Arizona State defeats Arizona, the Sun Devils will claim the Pac-12 South’s spot in the conference title game. Arizona State leads the league in interceptions (13) and ranks third in sacks (35), a combo that could make life tough for Oregon quarterback Marcus Mariota if center Hroniss Grasu isn’t healthy. Taylor Kelly rallied from a slow start against Washington State to prove he is the Sun Devils’ best option at quarterback. Arizona State’s 31 second-half points on Saturday show it’s able to match Oregon score for score. Congratulations, Florida State: Your reward for facing three straight power-running teams is an option attack. The Seminoles would have rather faced Duke’s spread offense here, but the Blue Devils lost consecutive games to Virginia Tech and North Carolina to give the Yellow Jackets the ACC Coastal crown. Florida State and Georgia Tech didn’t meet in the regular season. The ‘Noles will only have a week to prepare for this after their matchup with Florida. Missouri’s defensive line can take over a game, as it did in the Tigers’ 29-21 win at Tennessee on Saturday. Alabama and Mississippi State are most vulnerable when their quarterbacks can’t get into a rhythm, something Sims wasn’t fully able to do at Ole Miss, and Prescott wasn’t able to do at Alabama. The Tigers have looked shaky at times -- see: home losses to Georgia and Indiana -- but linemen Markus Golden and Shane Ray are two of the best at their positions in the nation. If Mizzou gets by Arkansas, it could present a tougher-than-expected challenge. It’s easy to see why this is a possibility: The Wildcats beat the Ducks 31-24 on Oct. 2. With Oregon’s offensive line still not at full health, linebacker Scooby Wright and Arizona’s defense could take advantage of the same unit that allowed them to stun the Ducks the first time. Tailback Nick Wilson carried the load after quarterback Anu Solomon left the Wildcats’ 42-10 win over Utah with an ankle injury, but Arizona will need Solomon back at 100 percent to take down Oregon. First, the Wildcats have to get past Arizona State and hope UCLA loses to Stanford. This is not the Big Ten title matchup casual fans want to see. No offense to the Golden Gophers, but they had a shot at Ohio State in snowy conditions on Nov. 15 and failed to capitalize in a 31-24 loss. Barrett dominated Minnesota, passing for 200 yards with three touchdowns and rushing for 189 yards with another score. David Cobb kept the Gophers close with a 145-yard, three-touchdown rushing performance, but even that, plus three Ohio State turnovers, wasn’t enough for Minnesota to pull the upset. The Gophers would have to beat Wisconsin this week to earn a rematch with the Buckeyes in Indianapolis. Given how Florida State’s season has gone, an upset here seems entirely plausible. The Seminoles have hardly dominated inferior foes, and the Gators could play inspired football in Will Muschamp’s final game at the helm. 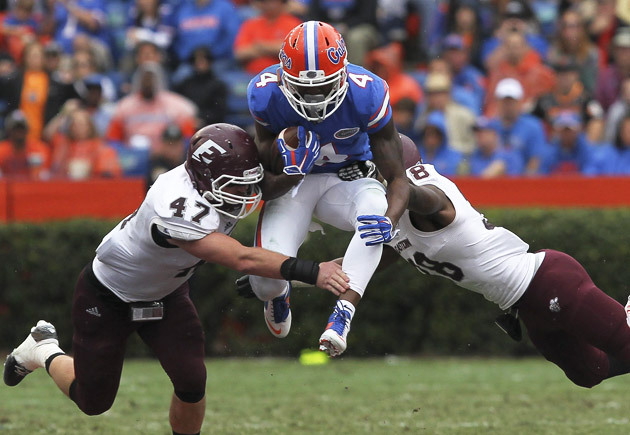 Florida's defense ranks 13th nationally with an average of 4.5 yards per play allowed. This may not be a banner season for the Longhorns, but Charlie Strong is getting his team to play his way. That has made it dangerous. Texas is riding three straight wins into Thanksgiving. The Longhorns have allowed just 4.4 yards per play this season, 10th nationally, and limited Oklahoma State to 3.7 per play in a 28-7 win on Nov. 15. Even Baylor managed only 28 points against Texas. Bears quarterback Bryce Petty passed for only 111 yards in that one, his lowest total as a starter. The Beavers upset then-No. 6 Arizona State 35-27 on Nov. 15. The atmosphere in Corvallis should be even more charged for the Civil War. Arizona created the blueprint for beating Oregon: Take advantage of a banged-up offensive line to pressure Mariota and limit the Ducks on third down. Oregon State’s defense could do that, and quarterback Sean Mannion is always a threat to go off. There’s no reason Michigan should hold any hope of wrecking Ohio State’s playoff chances. Of course, there was no reason Indiana should have either, yet the Hoosiers led the Buckeyes late into the third quarter on Saturday. The Michigan offense is dreadful, averaging 5.2 yards per play and converting only 38 percent of its third downs. The Wolverines defense still packs a punch, though. Baylor may be eager for its Dec. 6 clash with Kansas State, but it needs to get past Texas Tech first. This has all the makings of a trap game. Still, the Red Raiders defense has been awful. TCU hung 82 on Texas Tech. Baylor could aim for 83. Kansas nearly spoiled TCU’s playoff hopes, so the Horned Frogs can’t afford to look past any opponent, even the Big 12 cellar-dwellers. Although the Cyclones aren’t likely to take down TCU, this matchup is the Horned Frogs’ last chance to impress the selection committee. They can’t let Iowa State hang around.